If you’re anything like me, you probably get overwhelmed by the myriad problems that plague our world. It’s hard to be indifferent to all the suffering, injustice, and uncertainty that characterize human life. Wars, poverty, natural disasters, abuse, discrimination, disease, and human trafficking are just a few examples of what constitutes reality for so many people. We may feel helpless as we skim through the headlines and watch the news. We have a tendency to inflate the scale of global issues, believing that only people with power and funding can influence change, like politicians or tech giants. Compared to those groups and individuals, we may feel that our actions would have such an infinitesimal effect as to barely make it worth our while to fight against it. I certainly used to feel that way. My thoughts about the magnitude of the transformation needed for change to occur would shut me down. I’d use it as an excuse to avoid becoming an active and engaged citizen, denying my responsibility to my community, and the world at large. 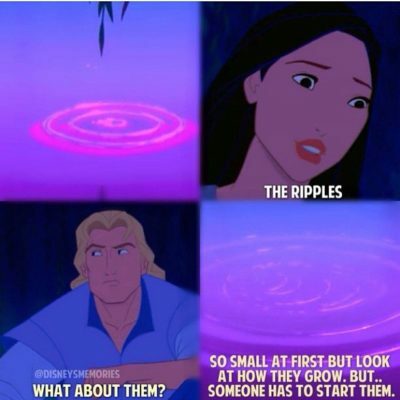 “The ripples!” Pocahontas responds in amazement. “What about them?” Smith asks while shrugging his shoulders. What Grandmother Willow demonstrated in that moment was the power of the ripple effect. Even a small attempt to create change will ripple out into the world and transform the energy of human consciousness. Every step that we take toward peace and love matters. What starts out as a small ripple can expand, and grow, beyond your imagination. Malala Yousafzai, a Pakistani education advocate, was shot by a gunman while she was traveling home from school. She survived to tell her story in her first published book, I Am Malala. She also gave a speech at the UN, won the Nobel Peace Prize, and started the Malala Fund, an organization that works on providing education in regions where girls often miss out on this opportunity. The world is in dire need of more warriors of light, like Malala, to open up the collective heartspace. Running away from our civic and moral isn’t going to make problems disappear. It will only give power to those who are driven by dark and fear-based intentions, vindicating their actions and policies. 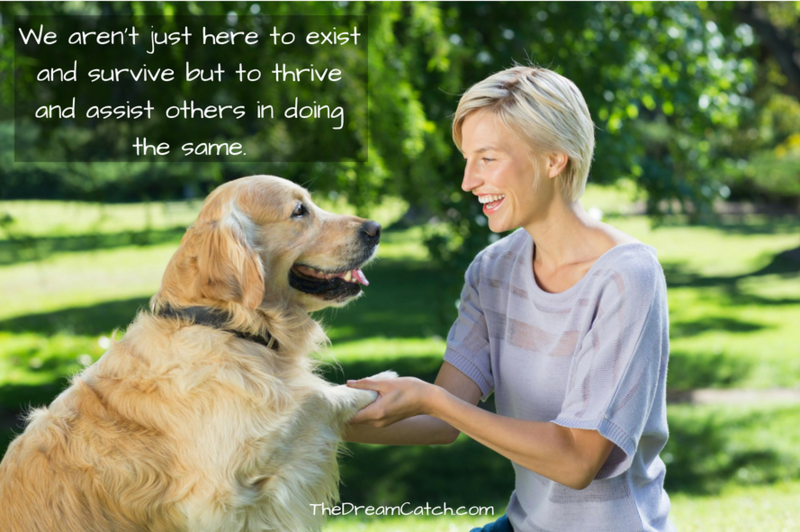 We aren’t just here to exist and survive but to thrive and assist others in doing the same. We are the only species on the planet that has the capacity for intelligent self-direction and the ability to lead our lives in the pursuit of noble and worthy goals. We have the consciousness and rational thought process to avoid being enslaved by a need for gratification, unethical ambitions, and addictions. We can control this reptilian part of us and replace it with a charitable and benevolent attitude. Supporting causes that are close to your heart connects you to something bigger than yourself and allows you to make a real impact on the world. There are many organizations, non-profits, and social movements that need the support of mindful and caring individuals. Whether you choose to contribute to a grassroots organization in your locality or a global initiative, you’ll find a new sense of meaning in your life and gain a higher perspective on your own issues. But, don’t go running off to wear your superhero cape just yet! There are certain limitations that you need to take into consideration. With so many new charities and ideologies emerging all the time, choosing the right ones to support can be tricky. How do we know which ones to trust, and which ones to ignore? We need to be selective and choose the ones that we can serve best, and that can make the best use of our precious time, money, and skills. 1. Get clear about your values and what’s important to you: The first step in finding which causes to support is to ask yourself a couple of important questions: What do you care about? Which issues tug at your heartstrings? What injustices make your blood boil? Which causes support your own value system and align with your purpose? What kind of impact do you want to have in the world? 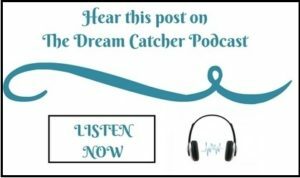 Have there been any personal experiences that have made something important to you, such as a relative being diagnosed with a certain disease, or a trauma that you’ve been through? Reflect on these questions and make notes. It’s important that you choose the ones that are dear to your heart and promote your passion because you’ll be more likely to be committed to it. 2. Research organizations and efforts that relate to your values: Once you’re clear on what’s most important to you it will be easier for you to narrow down the specific organizations that you could potentially contribute to. Do a Google search using the keywords that interest you the most, such as “Wildlife conservation”, “Disaster relief”, “Child sponsorship”, “School reform”, etc. The more specific your keywords are, the better. Ensure that the ones that you pick are reputable, trustworthy, and whose mission statements resonate with you. You can find more detailed tips on how to carry out this process in this article from CityPhilanthropy.org. If you can’t find one that you like, you can always start your own organization, or support a movement by starting a blog, starting a YouTube channel, or running campaigns in your local neighborhood. 3. Figure out how you would like to help based on your current resources: Your level of participation in the causes that you support all depend on the time investment, financial resources, and experience that are available to you. Most people believe that you must have plenty of money and time to invest in philanthropic activities, but that’s far from the truth. Even the smallest donation and time investment can help a charitable cause. But, you have to find a way of contributing that’s sustainable based your current life situation and the limitations that you face. For example, if you’ve just become a mother, you probably won’t have much time, or energy, to expend on hands-on volunteer work but you can make small financial donations. If you just graduated from college and you’re taking a year off you can volunteer to teach English to children in a developing nation. If you’re someone with marketing experience, perhaps you can use your marketing skills to help a non-profit build their platform. 4. Prioritize and organize: Once you have given your word and committed to helping a certain cause, you should make it a point to prioritize it in your life. Organize yourself and your schedule to accommodate all activities that are related to it. It’s important to get a sense of what will be expected for the role you are going to play so that you can allocate sufficient time, money, and effort. Stay mindful during this process and ensure that you’re fully aware of what you’re getting into. Without good planning and organization, there’s a possibility that you’ll become resentful of the demands that are infringing on your personal and professional goals. Mother Teresa once said, “We cannot do great things on this Earth, only small things with great love.” Every step that we take to make the world a better place should be infused with love. This is a selfless kind of love that’s universal and based on a love for humanity, known as agape by the ancient Greeks. Love is a potent force with the power to bring a pure and lasting state of peace and harmony to any situation, or person. 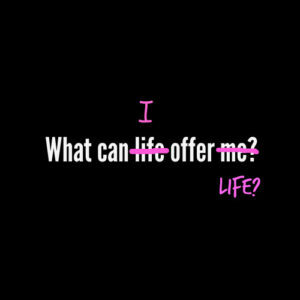 Question: What has helped you decide what causes to support? Just want to say hi and let you know that the quote at the very beginning is so powerful…its unfortunate that many people are forgetting this. We want to do something to help but at times we try too hard and up doing more harm than good. I have heard that quote before and used it to explain why I don’t always jump on every food drive, collection, or ‘good cause’ that comes around. I have to take care of my family- they are my responsibility- so I cannot always give to help others. But on that same token, I won’t do things to make life harder for the sick or homless and will od other things to help them when I can! Thanks for sharing this with us Seline! It is always good to get some words of support and encouragement. I know it is for me, especially since I don’t get a lot of support from the people in my life. Thank you for putting yourself out there for those of us who need the encouragement and support. It means a lot! First, do no harm- that need to be the way more people approach everything in life. I think a lot of the problems we have in the world today and a lot of the strife and conflict could be avoided if we have this sort of outlook. It is something that needs to be spread to all!